A powerhouse of versatility, the Rickshaw Zero Messenger Bag in Zebra, is perfect as a workday commuter, overnight attaché, or travel bag! Vibrantly printed with your custom artwork or text on rugged polyester and designed with a unique accessories system, this bag is as customizable inside as it is outside. Handmade for you with a focus on environmental sustainability, this bag combines beautiful form, function, and a small ecological footprint. Anyone determined to find rickshaw messenger bags will most definitely adore this unique commuter bag after it’s made with MaxQproducts’s Max Q’s Animals design. This zebra rainbow skin rickshaw messenger bag messenger bag will be cool and well-made, thanks to its strong strap and stitching. 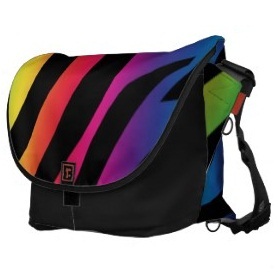 Pick your favorite color from the available options, and your customized messenger bag will surely look fabulous. Because of the range of options attainable for this rickshaw customized messenger bag, you will surely find the perfect messenger bag for anyone!